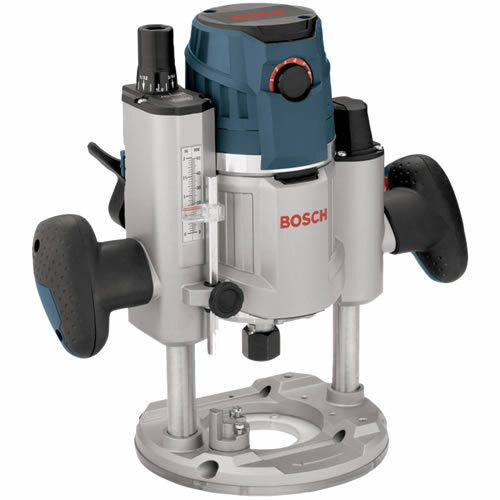 The best Bosch plunge router yet! The handle-mounted trigger is an industry first you’ll relish every time you turn the router on. Another key feature is the excellent visibility in the crucial bit area, illuminated with clean, bright LED lighting whenever the router is plugged in, and surrounded by a crystal-clear polycarbonate sub-base. But dig in a little deeper, and you’ll find that every aspect of this premium router has been carefully engineered: from the glassy smooth plunge action and rotating turret plunge-depth stops with microfine depth adjustment, to touches like the cord swivel and the flat rubber top for stable inverted bit changes. And with a 15 amp motor with 2.3 HP under the hood, you’ll be getting the most powerful router in its class.